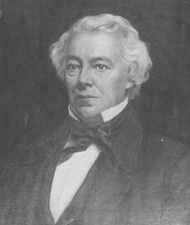 The American senator George Evans was born in Hallowell, Maine on 12 January 1797. He was graduated at Bowdoin in 1815, studied law, and was admitted to the bar in 1818. He began to practice at Gardiner, but afterward removed to Hallowell, and attained eminence as a criminal lawyer. He was a member of the legislature in 1825-28, and was speaker of the house in his last year. He was then chosen to congress as a Whig, and served six terms, from 1829 until 1841, when he was elected to the U. S. Senate, and served in 1841-47. During his twelve years in the House, although his party was in the minority, he exerted a commanding influence. In the Senate he was chairman of the committee on finance. Henry Clay is reported to have said that Evans knew more about the tariff than any other public man in the country. His speeches on important and complicated economical questions were very effective. He was a candidate for the vice presidential nomination when General Zachary Taylor was nominated for president, and after the latter's accession in 1849 was appointed chairman of the Mexican claims commission. He was Attorney General of Maine in 1853, 1854, and 1856, and was for twenty-two years a trustee of Bowdoin College, which gave him the degree of LL.D. in 1847. He died in Portland, Maine, on 5 April 1867.